The rapid increase in harvest volumes projected over the next decade gives rise to concern about the risk these operations pose to water quality. 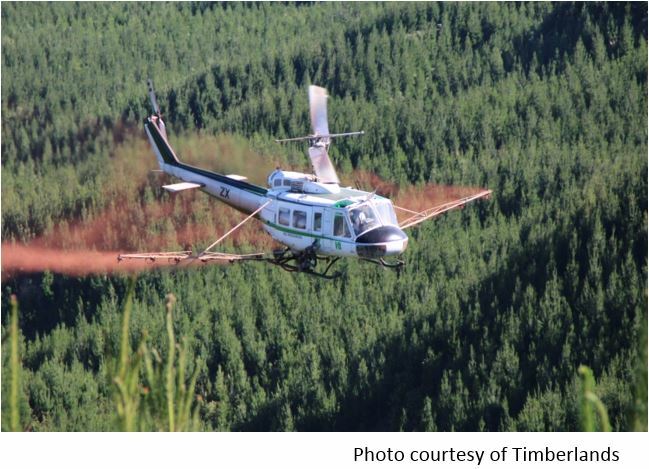 Many of the forests to be harvested are first-rotation, on steep, erodible soils. New roads will have to be constructed: current estimates indicate some 1,400 to 2,000 km of forest roads will need to be built annually until 2025.
develop some best practice guidelines to minimise the risk of ‘breakthroughs’, where sediment from forest roads and trails reaches streams via concentrated overland flow. Researchers visited 23 recently harvested forests, looking for ‘breakthrough channels’ via which water and sediment were reaching waterways. On average they found 3.4 breakthroughs per kilometre of stream, or one for every 6.5 hectares of harvest area. These frequencies compare closely with harvesting activities studied in the USA. steep skid-trail approaches with poor water control and surface cover can result in potential erosion rates exceeding 100 tonnes/ha/yr. inspect roads and skid trails periodically post-harvest to ensure drainage structures are continuing to function properly. Steep forest sites are highly vulnerable to landslides and erosion in the first years following harvest, with associated risks of sediment and debris reaching watercourses at the bottom of harvested slopes. The effectiveness of riparian buffers in mitigating sediment flows increases as slope decreases, but large storms resulting in landslides, debris flows and floods, override this. Forest managers need to know what can and what can’t be managed: the researchers concluded that there is still much to be learnt about the design of buffers to minimise sediment flows to streams in different landscapes and with different geology. More research is needed: the issue of post-harvest debris and sedimentation is definitely a risk to the forest industry’s public reputation. Er odeNZ is a mobile application, being developed by Scion, to collect on-site erosion and debris flow data. It aims to address the perceived lack of information and understanding of small-scale erosion and debris flow incidence. 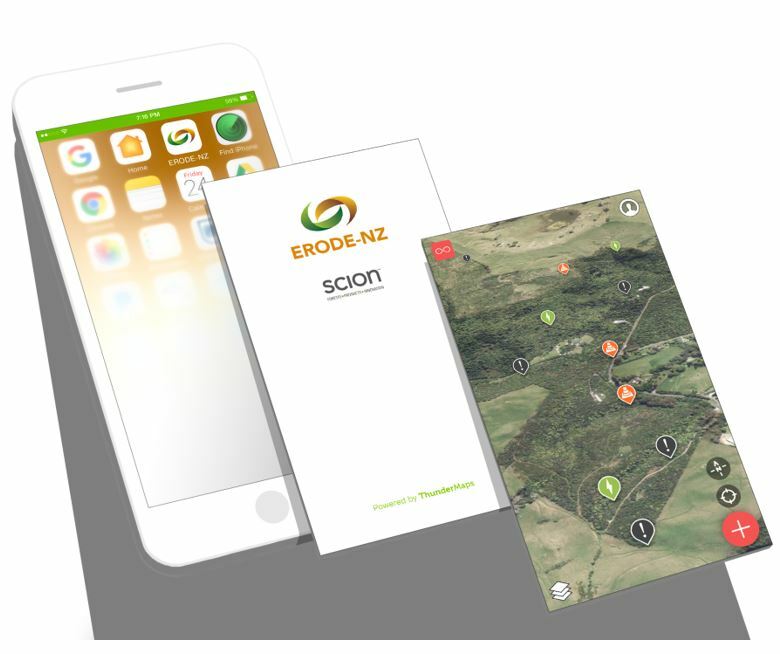 Erode NZ’s developers hope that forest managers, and anyone else with an interest in erosion, will take photos of erosion sites and/or debris flows using the ErodeNZ app on their mobile phone. The data will be automatically geo-located, and uploaded into GNS’s landslide database. From here, it will be accessible to research institutions, regional councils, and the general public, for analysis. By using this ‘citizen science’ approach, researchers hope to gain a much better understanding of erosion and debris flows in different locations and under different circumstances. Ultimately this will lead to better harvest management plans, reducing the risks of erosion caused by harvesting activities. A 2011 storm (270 mm of rain in 24 hours) that struck recently harvested catchments in Houpoto Forest, Bay of Plenty, initiated debris flows that scoured out the streams, devastating their aquatic life and riparian vegetation. Research to assess the recovery of three of these streams following this 1-in-100 year rainstorm was made easier by the fact that the aquatic life in the streams had recently been studied as part of a PhD project. The recovery of aquatic invertebrates and fish, and riparian vegetation, were all tracked over five years following the storm. 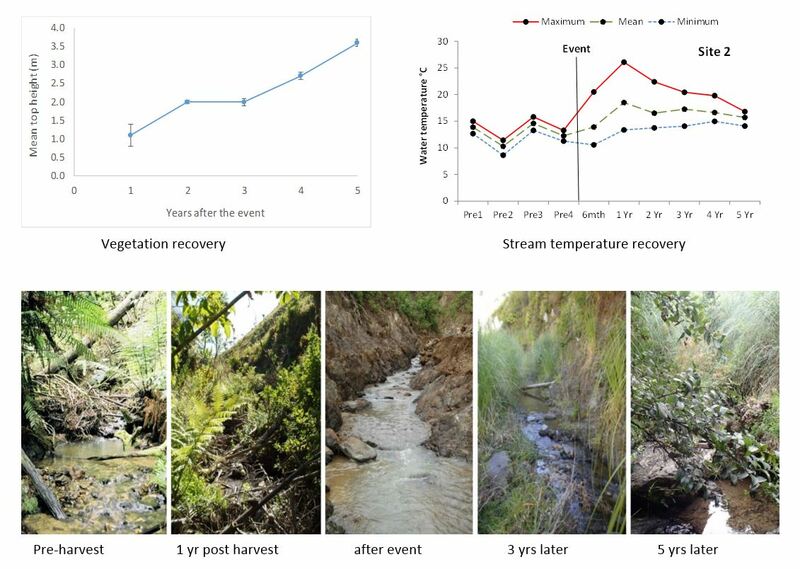 Overall, a reassuring picture of ecosystem resilience came through, although different components of the streams are on different recovery trajectories. Some fish and invertebrate species were back to at least pre-flood numbers after five years, but the composition of species did change as a result of the flood and some fish species have yet to return. Streamside vegetation was much slower to re-establish and stream temperature recovery was closely linked to vegetation recovery. Riparian vegetation recovery was a key factor influencing the recovery of the stream ecosystems. Recommended interventions to encourage stream biodiversity following severe storms, or if harvesting near waterways, include (i) retaining riparian vegetation, (ii) pro-active riparian re-establishment and, (iii) if accessible, strategically adding woody debris to streams to create habitat and a food source for aquatic life. Copper (cuprous oxide) is the standard fungicide treatment used for Dothistroma control. While copper is a naturally occurring element, essential for all living organisms, it is also considered potentially highly hazardous to aquatic life by the Forestry Stewardship Council (FSC). Scion was asked by the forest industry to assess the fate of copper, applied under normal Dothistroma spraying conditions, in forest streams. The research involved three separate forests in the central North Island, with trees of different age classes; all were typical of the type of forest likely to be sprayed to control Dothistroma. 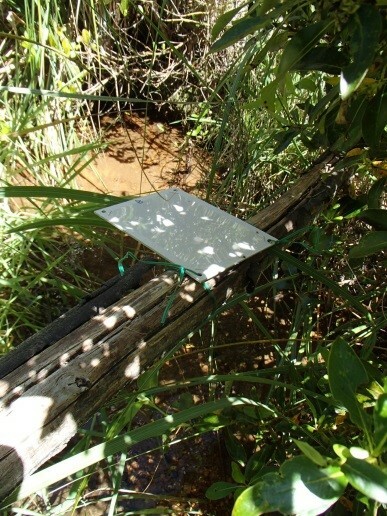 Tracer plates (see fig) were used to measure the amount of copper reaching the water surface in the forests. Stream water and sediment were sampled for three months following the spraying to check copper levels. The ecotoxicology standard for aquatic invertebrates used by FSC, which is based on a 48-hour time period, was exceeded but for less than 2 hours. Under today’s operational conditions, and on these typical sites, the risk to aquatic environments from copper appears to be low. This supports the case for continued use of copper in NZ’s plantation forests for Dothistroma and (potentially) Red needle cast control. 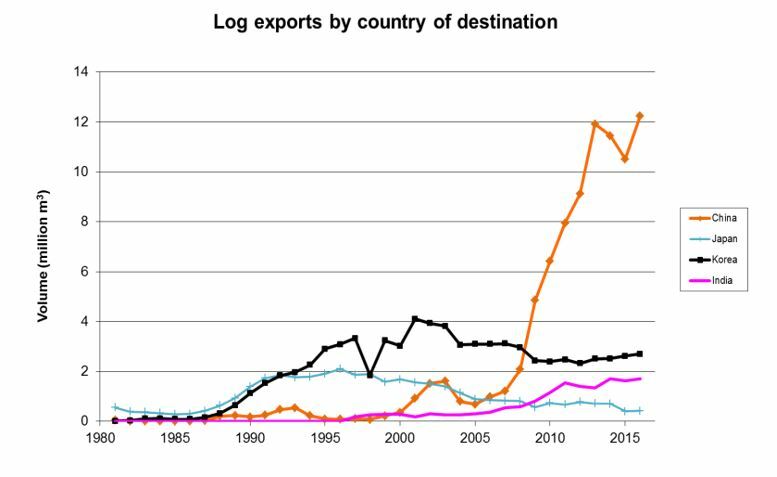 A recent review of material flows and end uses of New Zealand’s log exports focused on three main export markets which combined take some 96% of all log exports – China (68% of 2015 log exports), South Korea (17%) and India (11%). New Zealand’s main log exporters were surveyed to gather information about the destinations and end uses of their logs. In addition, researchers visited each country to gain more detailed information about what actually happens to NZ logs once they reach those countries. This research aimed to gain insight into the wood products produced from New Zealand logs, and the lifespan of these products. Models were developed to quantify the harvested wood products (HWP) manufactured in each country, and the lifecycle of these HWP. 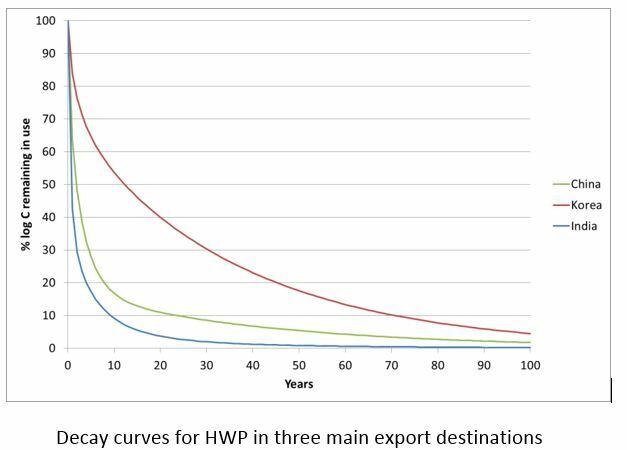 This in turn enabled the calculation of decay curves for HWP in each country. Ultimately this will inform calculations on carbon liabilities at different times in the lifecycle of timber. China: carbon stocks in HWP are halved in just under two years. Some 46% of the HWP is in lumber and plywood used for temporary construction, while 13% is lumber and plywood used for packaging, which is also short-lived. South Korea: carbon stocks are halved in just under 12 years. Although the 42% of material used for temporary construction has a short life in this intermediate use, most is recycled into longer-lived particleboard. In addition, 30% of log volume (mainly sawmill slabwood and plymill residues) goes to produce medium density fibreboard (MDF), another relatively long-lived panel product. India: carbon stocks in HWP are halved in less than one year. Some 26% of radiata pine log volume is used directly for fuel. This includes slabwood (14% of log volume) and most sawdust (12%). Construction lumber (27%) is used for fuel after use for concrete formwork. Packaging material (31%) is also short-lived, especially domestic packaging. In combination, the aggregate decay curve for the three countries indicates carbon stocks are halved in just over two years. These findings have implications for New Zealand’s international carbon accounting and reporting. In addition, if the deferred liability for emissions from the HWP is devolved to forest growers participating in the NZ Emissions Trading Scheme, whatever decay rate is adopted will likely have a major impact on the carbon stock profile over the life of a tree crop. This will affect forest profitability and risk, and hence the financial viability of afforestation. For full details of this project, see: Manley, B. and Evison, D. (2017) Quantifying the carbon in harvested wood products from logs exported from New Zealand. NZ Journal of Forestry (62) 3, p36-44.